Regal Plastics would like to congratulate Angie Hernandez in our San Antonio branch! 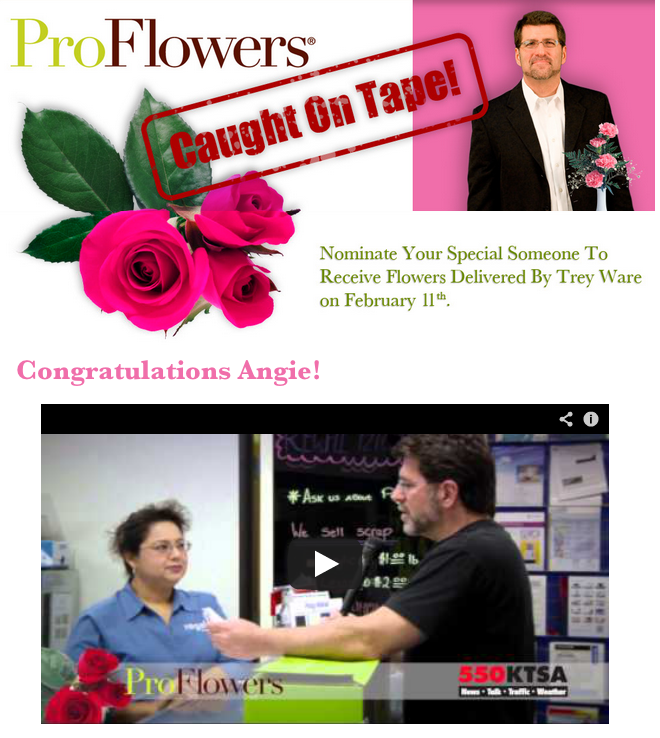 Angie’s mom, Mary, nominated her for KTSA 550’s Caught On Tape. Trey Ware surprised Angie with flowers from ProFlowers on Monday. The questions was: Why Should You Win? Angie is my daughter and she is very special to many persons. She is always there for me, her dad, her brothers, her children, and her husband. She is always looking for ways to help others like her in laws and neighbors. She is very involved in her children’s school and daycare. She was there when I got very sick with recurrent heart problems, always very compassionate of other’s needs and making sure everyone is good. Her co-workers and her boss are always appreciate of her and of her ways of handling conflicts and making her department and the store come out at its best. Thank you in advance. A long time listener and fan. Congratulations to Angie and Happy Valentine’s to all! Click the picture below to see the video of Angie’s surprise. Thanks, Amy. OMG I never thought it would get to your main office. I am very proud of her and all of her accomplishments, and I’m thankfull for your company in recognizing all her efforts.